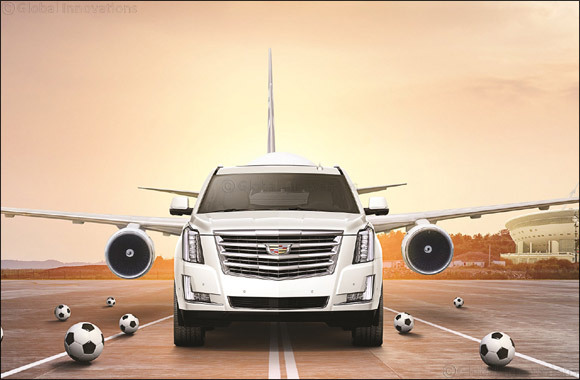 Dubai, UAE, March 13, 2018: With the 2018 FIFA World Cup fast approaching, Cadillac Alghanim is giving its customers the chance to win a once-in-a-lifetime trip to the finals of the tournament in Russia, offering a five-star experience that matches the luxury standards of a premium brand such as Cadillac. From the 1st of March, customers will have the opportunity to win either one of three all-inclusive five-star trips to attend the FIFA World Cup Final in Moscow or one of five all-inclusive five-star trips to attend one of the semi-final games, with every purchase of a new Cadillac model. In addition to the eight grand prizes, customers purchasing a new Cadillac will also enjoy a variety of other incentives, dependent on the model. Running in time with the 70th anniversary of Cadillac Alghanim, the new offer will apply on the full 2018 Cadillac product lineup in Kuwait, consisting of the brand’s SUV, sedan and V-series offerings. This includes the flagship SUV, the 2018 Escalade, which features a new 10-speed automatic transmission and bold new interior and exterior color options. The Escalade has long defined spacious premium driving with its modern design, powerful capabilities and sumptuous amenities that keep luxury firmly in the driver’s seat. For those looking for a sophisticated crossover, Cadillac’s answer is the XT5. Powered by a 3.6-liter V6 engine and advanced all-wheel drive, the XT5 combines spacious luxury and high-tech convenience features to create an ideal crossover. A lightweight construction elevates efficiency and driving performance while the new design and structure increases interior space without adding bulk. Built with one of the industry’s most advanced body structures, the 2018 CT6 has all the size, prestige and technology of a large luxury sedan, while offering the driving dynamics and efficiency of a mid-size sport sedan. The CT6 is equipped with an Active Chassis system and either a 3.0L Twin Turbo or 3.6L V6 engine. In terms of large premium sedans, the redesigned spacious and comfortable 2018 XTS offers confident handling and performance, enjoying technical, chassis and appearance changes to heighten the appeal of this elegant sedan. Also taking pride of place in the Cadillac Alghanim showroom, the 2018 CTS displays precise craftsmanship, ingenious technology and assured performance. With the standard 2.0L Turbo engine, the CTS is designed to make the most of handling and stability in all driving conditions. The more compact of the two models, the 2018 ATS is one of the most connected cars in the segment and the centerpiece of Cadillac’s expanded and elevated portfolio, boasting exterior appearance upgrades, technology features and streamlined trim levels. Tested at the track and ready for the road, Cadillac’s V-series models are proof of the brand’s promise of passion without compromise. The Cadillac CTS-V sedan combines luxury and power in one machine, powered by a supercharged 6.2L V-8 engine, that delivers 640 hp (477 kW), 630 lb-ft of torque (855 Nm), mated to a paddle-shift eight-speed automatic transmission. “Our full lineup of Cadillac models caters to individuals who dare to stand out from the crowd and live their passions, while taking into account a variety of needs and lifestyles,” El Talkhawi added. In addition to the opportunity to win an all-inclusive break to the FIFA 2018 World Cup in Russia, incentives for Cadillac Alghanim customers purchasing 2018 Cadillac models include an iPhone X with the purchase of the 2018 XT5 as well as trade-in offers for 2018 ATS, CTS and Escalade. All models are offered at competitive starting prices.